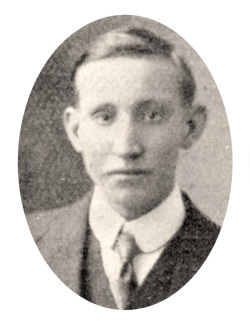 Alfred was the youngest of six children. His father was Henry James Taylor, a warehouseman. The family lived in Edmonton. Alfred worked as a printer compositor. He was 21 and single when conscription was introduced in 1916 and so was one of the first group to be called up under the Military Service Act. By March 1916 he had applied to his local Tribunal, Edmonton, for exemption as a conscientious objector. Alfred couldn’t accept this verdict, his conscientious objection being grounded in his religious belief in an absolute command - “Thou shall not kill”. As an Absolutist CO he held the belief that any work for the army, or the war effort was unacceptable - morally the same as taking up a weapon to end someone else’s life himself. He decided to appeal against the decision of the Edmonton Tribunal, and was heard at the Guildhall in April 1916. The Appeal Tribunal refused his application. Soon after, Alfred was arrested as an absentee from the Army and taken to Tottenham Police court. Together with other local Absolutist COs including Stuart Beavis and Fred Murfin, he was charged as a deserter, fined 40 shillings (or 14 days imprisonment) and handed over to the army. Once under the control of the army, Alfred’s objection was put to the test. Arriving at Mill Hill Barracks he made it clear that he would refuse to undertake any military order and so he was forcibly stripped and placed in uniform. After court martial he was dumped into military detention in Warwick and Seaford. By June 1916 handcuffed, abused and deprived of both freedom and any basic human rights, he had been herded onto a troopship and sent to France. On the way he was told that disobeying orders in France - “the combat zone” - could be met with the harshest military punishment: execution. In the first few days of June Alfred, along with 34 other COs was facing almost daily reminders that unless he obeyed orders, gave up his principles and willingly joined the army he would certainly be shot. After a court martial in Boulogne that found him guilty of disobeying military orders, he was sentenced to death on the 13th of June 1916. At almost the last possible moment, Alfred and the other COs who would become known as “the Frenchmen” were saved. The military, caving in to considerable political pressure from CO supporters back in England had realised the terrible furore that would result from the murder of a Conscientious Objector. The COs sentenced to death were taken back to England and imprisoned in Winchester prison. Soon after, the military would try to wash its hands of the CO problem, transferring them to civilian prisons for the rest of the war. Alfred was one of many Absolutist COs who would make no compromise with the military and civil authorities that wanted to force him into becoming a soldier. Totally refusing all alternative work, he was kept in prison for more than two and a half years, and finally released from Maidstone Prison in April 1919. After the war Alfred returned to the printing trade and became a regular attender at the Tottenham Friends Meeting. In 1922 he was married to Ivy Nash at Tottenham Friends Meeting House. They both subsequently joined the Society of Friends. Alfred served the meeting in many capacities. He and Ivy remained in Tottenham until their deaths. Alfred died in 1964 and Ivy in 1977. Address: 13 Wellington Avenue, Lower Edmonton, London.